In a recent post of mine I talked about the new Balance Me Tinted Wonder Eye Cream (here). 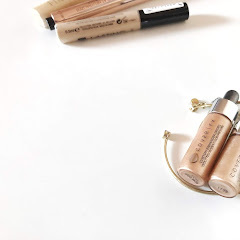 For me it was something new, a skincare/makeup hybrid that was unlike anything I've tried before but I was amazed at the effect it had on my under eye area. 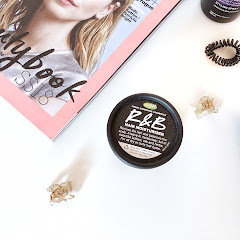 The post was also one of my favourites to write as I actually enjoyed doing the comparison pictures, even though editing zoomed in pictures of your eye can be a tad odd! 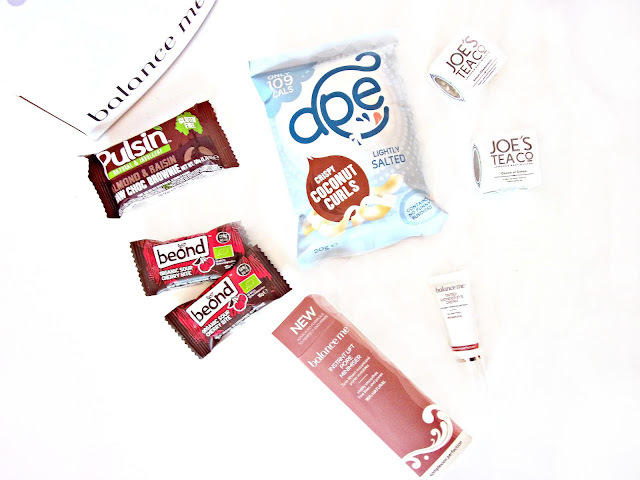 Anyway, the post was all written and done, and then out of the blue, whilst I was under piles of essay writing, I got an email from Balance Me to say that they'd love me to try out some more goodies from the range. I was absolutely fangirling at this point and when I received the parcel I was in awe of the immense effort they went to. There were treats in there and a lovely handwritten note that made my day. It's definitely one of the nicest gestures I've had throughout my blogging journey where a brand has reached out after reading a post of mine. 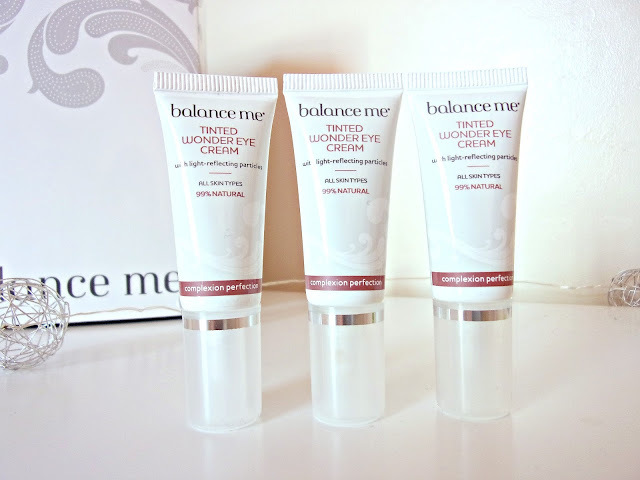 I have to admit that I have fallen in love with Balance Me's ethos. Their aim is to promote natural skincare, their products don't contain any parabens, sulphates, mineral oils, silicones or artificial fragrances. I'm not entirely sure but I think this could perhaps be the reason why the products feel so lightweight on my skin, they absorb without a trace. 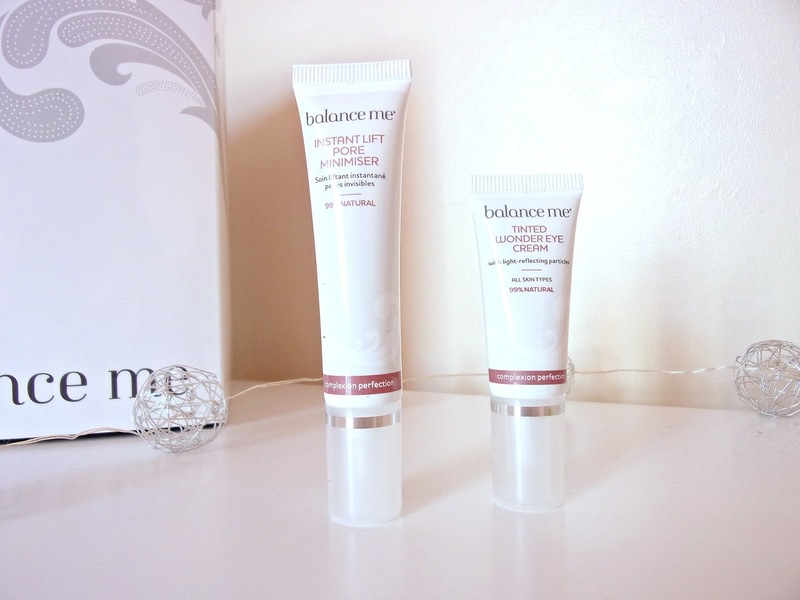 Balance Me is also about finding that healthy balance in our lives, and their products are designed to enhance our natural beauty. 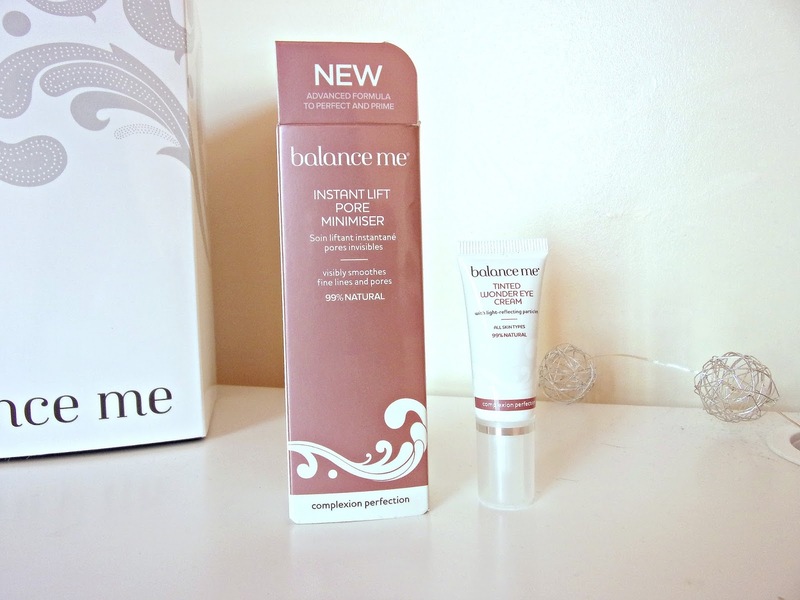 One of the products I received is their new Instant Lift Pore Minimiser*. It's designed for all skin type to smooth, blur and prime the skin. Whilst minimising pores is it's main claim, it also claims to plump fine lines thus reducing the appearance of them. I don't have any fine lines just yet so I can't comment on that, but my skin does feel a lot smoother to the touch, it doesn't feel uneven or bumpy. The primer has a lovely creamy texture so you can massage it in just like you would do with any other facial cream, the texture also makes it perfect for dry skin as it doesn't stick to certain areas but glides on uniformly. There is a slight scent that's hard to place when you first apply it but it soon disappears. The primer has a satin finish which gives off a lovely natural glow and a slight dewy look on it's own but it's not too noticeable. Acacia Gum - blurs over pores and helps plump fine lines, lifting the skin's surface. Acmella Oleracea - relaxes muscle contractions to prevent future signs of ageing, this sounds a lot scarier than it is! I didn't notice any of my muscles freezing and I have massive cheeks which I could still move. Hyaluronic Acid - one of the most talked about ingredients that plumps and hydrates the skin. Blackberry Leaf extract - boosts collagen production. So how did the minimised pores claim stand up? First of all, I have some clusters of enlarged pores which are around my nose. They're much worse on my left side for some reason. After applying the Instant Lift Pore Minimiser* my pores on my right side had disappeared, however on my left side, whilst they are noticeably reduced, I can still see a few peeking out. The 15ml which I have costs £22 here. Whilst it is on the pricier end of the spectrum you're essentially getting two products in one, a skincare item and a makeup primer. It might also be good for those who like investing in skincare. The primer also wears well throughout the day and creates a smooth surface for applying your makeup over. The second product I received to try is their Tinted Wonder Eye Cream*. The reason I have three of these is because I brought another back up in Glamour after loving it so much, you can't have enough of a good thing right? I'm also interested to see how it fares in the long run, and I might put an update in this post. For the detailed review, with comparison pictures, click here. To sum it up however, I used to wear glasses and so I have slight hallows around my eyes, and whilst concealer covers up the discolouration, it doesn't lift that area up so to speak. 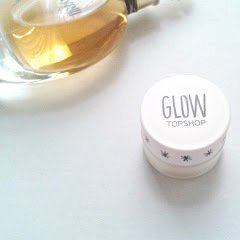 This eye cream with it's reflective particles however does just that! It makes my eye area seem a lot brighter and I'm not as reliant on concealer as I would be without it. Overall, I'm really glad I got to try out these products. Not only do they prep the skin perfectly for makeup but they can also be used on their own. It might seem strange using a a primer without foundation but I've found that the primer smooths over any little problem areas and just gives me a more even looking base. Yes it might not be flawless, but it's quick and easy. The eye cream also means that there are days when I'll go out without concealer, and I won't worry about looking like a panda so much. As if the above wasn't cool enough, I was also sent some snacks. 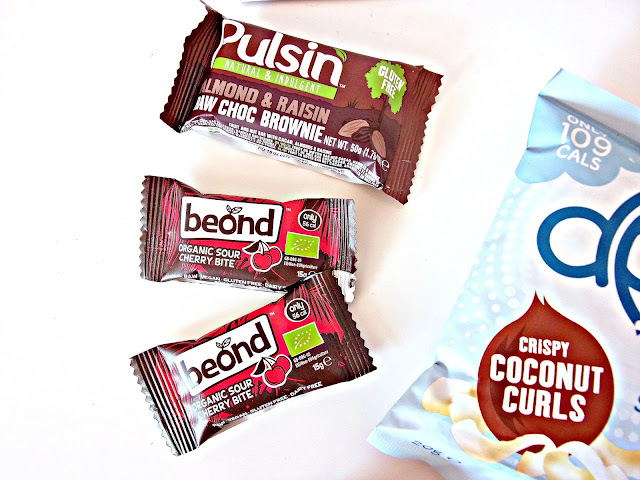 The Beond cherry bites* are my favourites, they're basically raw fruit bars that are suitable for everyone, whether you're gluten free, soya free or vegan. They're not too sour and have quite a filling texture. The Pulsin Raw Choc Brownie* did come as a taste shock as it did truly taste raw, if that makes sense! It doesn't have any flour in it, and the flavour come across like dark chocolate so it's not as sweet as the brownie bars I normally pick up (I don't even want to imagine how much sugar is in those!). It is a nice alternative to normal chocolate bars though if you don't mind it being sweetened down, it was like more of a patty that you can break in chunks. They really do have Coconut everything nowadays! 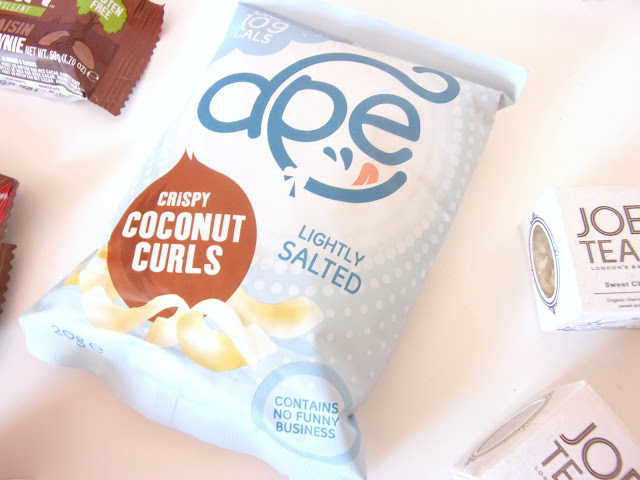 These coconut curls* are a bit like flakes, they don't taste like any crisps I've had before but they're a good snack to fill you up between meals without feeling like you're junking out. The flavour I had was lightly salted, although the more of them you eat the more you can taste the salt. Lastly, Joe's Tea Co is an organic tea supplier in London and if you asked me what was the most British thing I did, it would be my tea and biscuits time, everyday without fail! 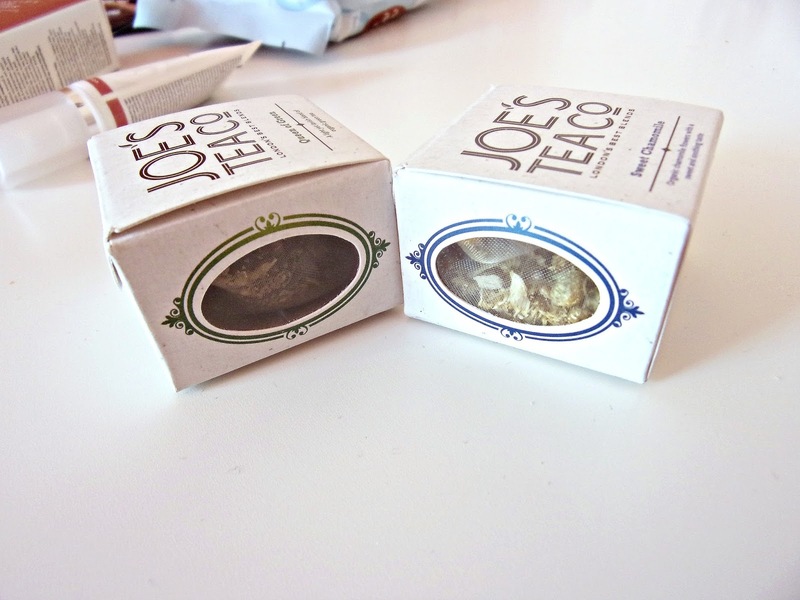 This matchbox range is a great way to try some some other teas, which means I'll be having a break from my usual breakfast tea. I feel as if I'm writing this after one of the longest breaks I've taken from blogging. I hadn't wished to take a break but I guess I became really overwhelmed by everything. I hadn't been feeling well for the past few months and then it got worse, although I have been feeling a bit better in the last week. Then on top of that I had an important assignment due in and I was really busy at work so it felt like I had no time for anything. Putting all of that to one side I'm feeling more refreshed and ready to crack on with blogging again, I just hope that I can carry on doing what I enjoy! 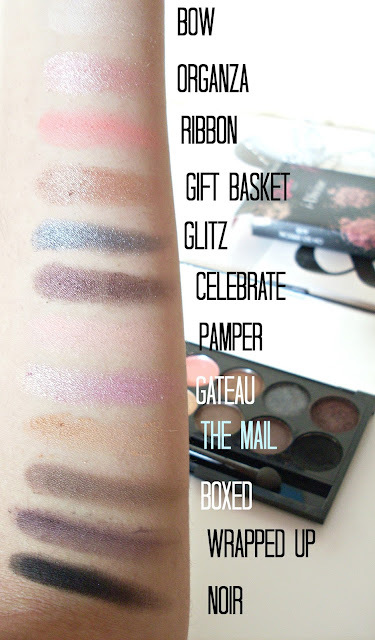 I'll just get right to it, Oh So Special by Sleek is my favourite eyeshadow palette of all time! 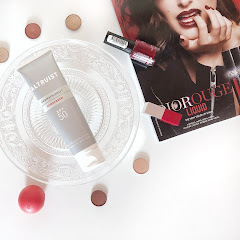 It just has the perfect mix of shades for me, with this one palette I can create everything from a subtle neutral eye to a more smoked out burgundy look. Nearly all of the 12 eyeshadows in this palette are of great quality, and it's not too expensive at a RRP of £7.99 here. This palette contains 5 shimmers and 7 mattes. 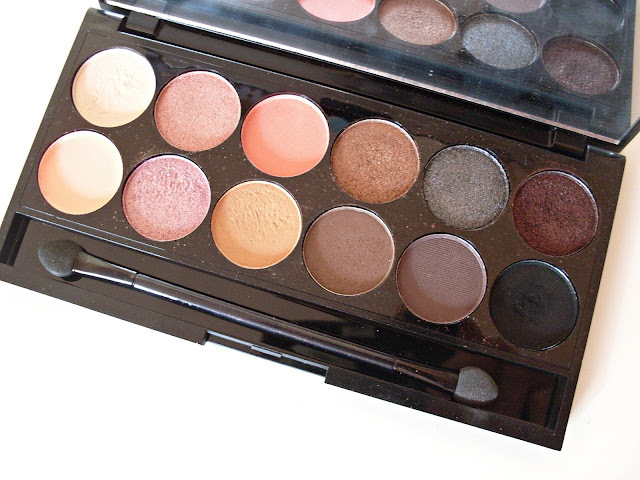 Not only do the eyeshadows look amazing in the pan but they also apply very true to colour. They're very pigmented, especially the shimmery shades, so much so that they almost have a luminosity to them. Generally I haven't felt the need to wear a base with these but I do pop on a primer if it's going to be a long day. As is generally the case with Sleek palettes they include a light highlighter shade, an off white, and a deeply pigmented black, Noir, which doubles up very well as a powder eyeliner! I love using it with the Nanshy eye liner brush to get a bit of definition around my lash line. Bow - Applies transparent but it can work well as a base as it brightens up the eyelid. Organza - A lovely shimmery role gold, however it can be a bit hard to layer it as it's quite a glittery shade. Ribbon - A warm matte peachy pink, great as a crease shade. Gift basket - A warm glittery copper brown. Glitz - A stunning metallic midnight blue! Celebrate - A dark shimmery burgundy. This is one of my favourite shades ever! Pamper - A matte pale rose pink. Gateau - A bright glittery pink, but like organza it's a bit hard to build up. The Mall - This was quite a neutral eyelid shade for me so it didn't show up too much, but it can be good for toning down the other shades by going over them if you've applied too much. Boxed - A slightly cool matte medium brown, perfect for the crease. Wrapped Up - A taupe matte grey, with a slight aubergine hint. Noir - A matte black. I just had to include this picture as it sums up the palette perfectly in my eyes, look how beautiful these shades are! 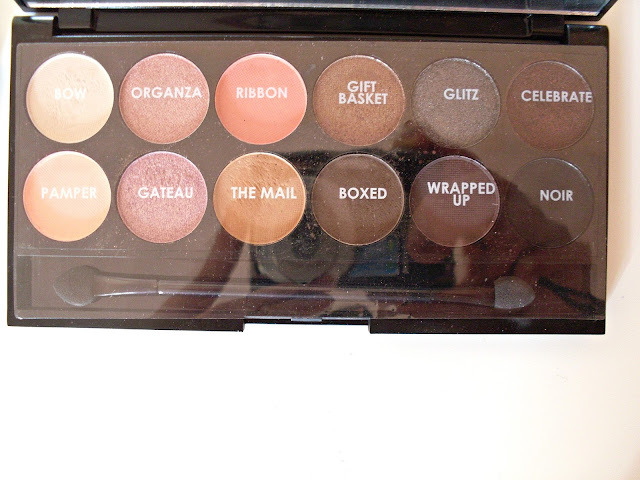 Overall, this is the palette I normally reach for by default whenever I have a special occasion, and I would really recommend this as there's so many possible looks you can create with this on it's own. 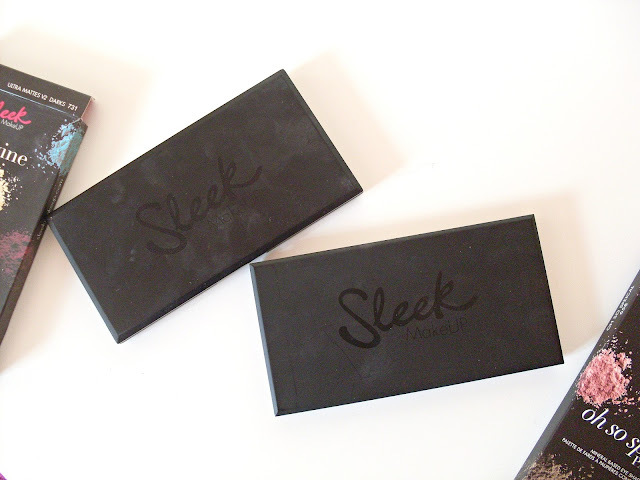 The quality is also just what I would expect from Sleek, and all at a very affordable price! 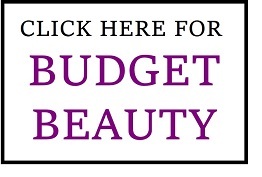 Have you given Sleek palettes a go before?